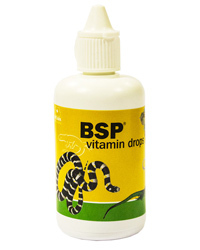 Even large snakes fed weekly or fortnightly and supplemented at the time can benefit from vitamins in their water in the interim. They are often fed frozen laboratory rodents which are often overweight. This can lead to vitamin E deficiency and steatitis (inflamed fat) which is prevented by use of BSP. Tortoises may also develop steatitis but will often accept vitamins in the water when they avoid vitamins on food (preferring to eat the plants in the garden). Lettuce is low in carotene and vitamin A and is a staple item for most tortoises, BSP gives an alternative way of providing this vitamin.